Halloween is upon us and this is a busy time for families. There are costumes to be arranged and house decorations to be done along with errands, family schedules and responsibilities. Sharing a Halloween survival guide for mom to make it through the season with flying colours and a sane mind. 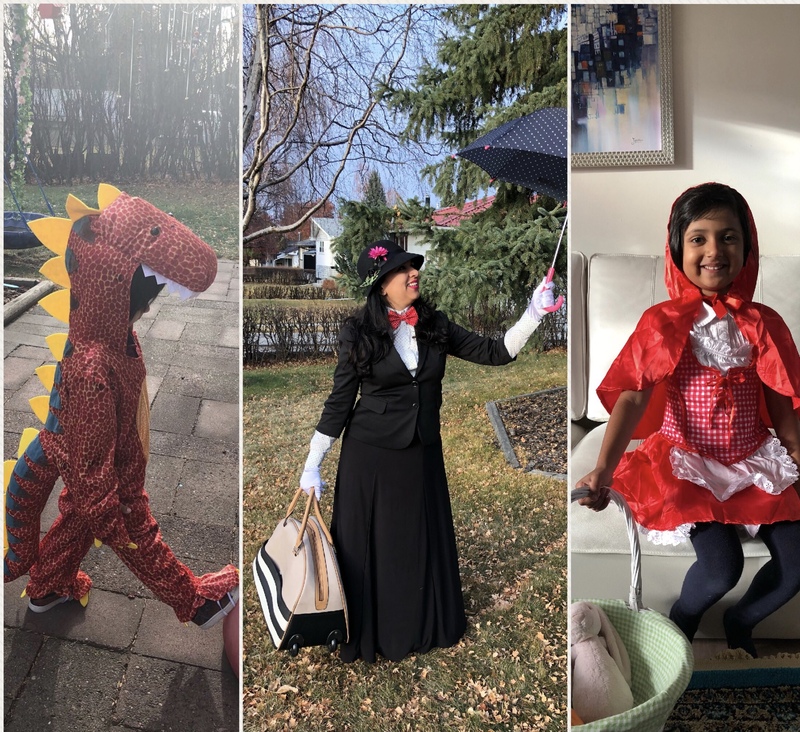 Before we start, here are the costumes we are all doing this year! Every family has their own particular preference for Halloween. Some can’t wait to start preps from September, some don’t really celebrate it and others are in it just for the candy! For us, Halloween is a great time of the year to visit with our neighbours, make some new friends and dress up in fun costumes. Sharing some Halloween survival tips for families and especially Mom! Costumes are one of the main attractions for children around Halloween. However, you need to strike the right balance in knowing when to buy their costumes. Buy it too early and they will likely change their mind as the event gets closer. Buy it too late and you will probably not find their size. Here are some great and simple DIY ideas for both kids and adults, if you are on a budget and/or feeling crafty! Talking about costumes for adults, don’t leave your own for the last minute otherwise it will be one more year dressing up as a witch! Keep a good supply of candy on hand for children who will start ringing your door bell right after 6pm! It’s always a challenge figuring out how much candy to buy! A good estimate is the approximate number of visitors you had last year plus a little more. You can also talk to neighbours and get their estimates. Try and be more inclusive and accepting this Halloween. There are many who don’t celebrate the occasion. Respect their decision and don’t question or debate it. There are many who mark the occasion in their own ways. Some won’t trick-or-treat but will pass on candy etc. Let everyone celebrate or not based on their own beliefs. There are also many children who have allergies and can not accept candy. You can make them feel welcomed at your house by participating in the Teal Pumpkin Project where you offer non-food treats and display a teal pumpkin at your house. All details about this project here. Have fun with your children and decorate your house with these great crafts. Stay warm during trick-or-treating. Children can be encouraged to wear jackets by adding their costume details on top of their jackets such as masks or glow-in-the-dark scarves. Keep safety in mind. Stay on well-lit paths and make sure you and your children are always visible while crossing the roads. Encourage/force/bribe your children to eat a healthy dinner before trick-or-treating starts. Talk to your children about dental hygiene and encourage them to portion out the candy to be eaten in moderation. Some dental offices also offer candy swap programs with incentives for children. Keep your skin nourished in the harsh October air. A great lip balm on hand keeps lips from drying out. I love the Naturalene Lip Balm by Greeniche because of its all natural ingredients which make it safe to use for the whole family. Love all the flavours: strawberry & cream, vanilla, mango tango, beeswax and spearmint. Mary Poppins all the way!! Esp the polka dot umberalle and bow! !